This recipe is adapted from Sweeter Off the Vine: Fruit Desserts for Every Season (Ten Speed Press) by Yossy Arefi. Luscious cherries, oats, poppy seeds and lemon zest give this Amish Friendship Bread cake a major boost in flavor, crunch and moisture. It’s the best of both worlds — a warm, tender cake with a crumbly, slightly crispy topping. I’m so happy to kick of the new year with this fabulous Amish Friendship Bread recipe. If you follow me on Facebook, you’ll know I am SUPER excited for 2018, because I love fresh starts and new beginnings! 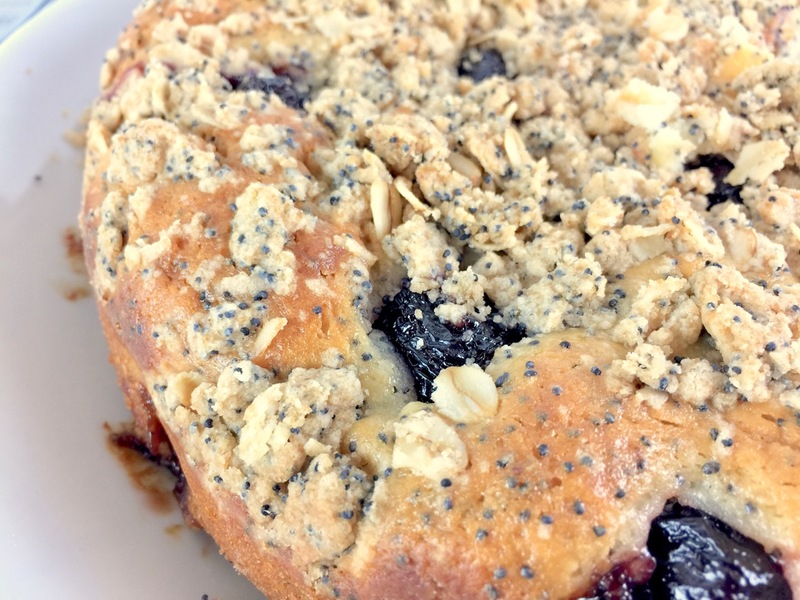 This Cherry Poppy Seed Amish Friendship Bread Cake is the sort of recipe you want to have on hand when the weather is chilly and everyone’s looking for something delicious and uplifting. I swear, you will feel better after just one bite. Chalk it about to 2018 Amish Friendship Bread magic. This post contains affiliate links. If you click through and make a purchase, the Friendship Bread Kitchen may earn a commission at no additional cost to you. We are grateful for your support! A few Kitchen notes: I used canned whole cherries, drained. If using frozen cherries, fold them in while still frozen. Both work really well with this recipe, so use whatever is most convenient for you. If you keep cardamom in your pantry, swap that for the cinnamon. Rolled oats can also be found on the shelves or bulk bins as old-fashioned or whole oats. 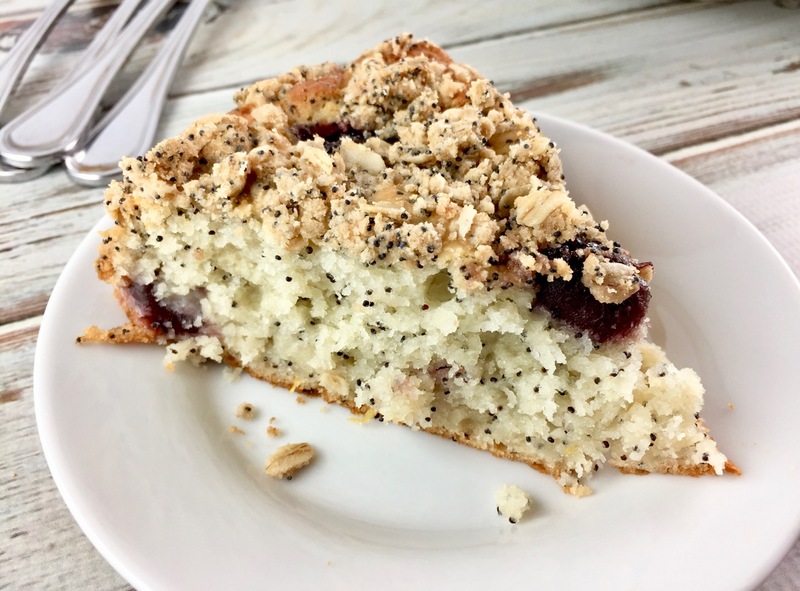 This tender Cherry Poppy Seed Amish Friendship Bread Cake balances tart and sweet, with just the right amount of crunch. Preheat oven to 350° F (177° C). 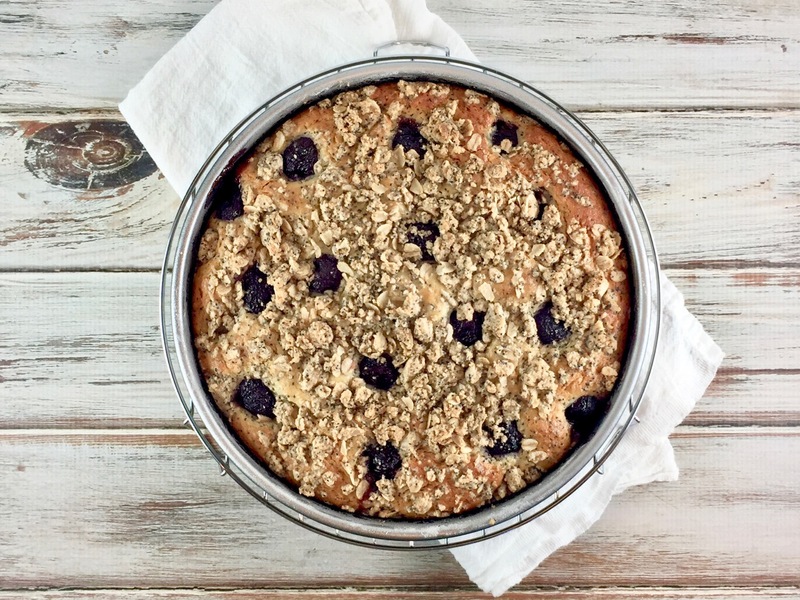 Grease and flour one 9″ round cake pan. Zest two lemons, and set zest aside. Juice the lemons and set juice aside. In a small bowl, whisk dry cake ingredients: flour, baking powder, poppy seeds and salt. Set aside. In a large bowl, rub sugar and lemon zest together with your fingers to infuse the sugar with the lemon oil. Whisk starter, oil, eggs, yogurt and lemon juice. Mix dry mixture into wet ingredients until just incorporated. Fold in half of the cherries and pour batter into prepared pan. Dot the remaining cherries over the top of the batter and sprinkle with streusel. Bake for 55-60 minutes or until a toothpick inserted in the center of the cake comes out dry. Let cool. Hi Kristy! Yes, you can absolutely do this in your bread pans. Our Conversion Tables page has all the info you need to figure out the different ways to adapt a recipe: https://www.friendshipbreadkitchen.com/conversion-tables/. Good luck and post a picture of your bread on our Facebook page, we’d love to see it!